Skipper Kwesi Paul with his talented young crew Justin James, Kiron Benjamin and Kimo Sampson Sailing in Gybe Talk, one of the five matched design boats owned by Grenada Sailing Festival, stormed through the finish line to bring the title of Champion of Champions, and a cheque for US$1,000 back to Gouyave, after two years of having to settle with second place. Gouyave crews were on the water for the GSF16 Match Race Finals determined to win and also took command in the National Team Sailing, with first place in the Senior Final race, sponsored by Carib, and second place in the Junior Final race, sponsored by Budget Marine. Sailing action took centre stage on Grand Anse Beach on Saturday 31 January, and Sunday 1 February, as the 22nd annual Grenada Sailing Festival White Jack Workboat Regatta took place, bringing high adrenalin racing and fun feting to a record crowd of local supporters and overseas visitors. In excellent weather and sailing conditions a strong fleet of 28 boats from Carriacou, Gouyave, Petite Martinique, Sauteurs, Mayreau and Woburn lined Grand Anse Beach — bringing their well-known and much-loved colour to its shores again. This year for the first time two boats from Bequai competed in the Regatta, and a crew from Guadeloupe sailed to Grenada especially to take part, racing in Swift, a boat prepared for them by sailors from Grand Mal. After another two races in The Community Class Series on Sunday morning the scene was set for an afternoon of Match Race Finals. The excitement levels moved to a new high as the growing crowds on Grand Anse Beach waited for the boats and teams to be picked for the National Team Sailing Match Races in the fleet of GSF16s – 16′ workboats owned by the Grenada Sailing Festival. The racing was as tough as ever and in the Budget Marine Junior Final, Team Carriacou, sailing in Pink Gin, came through to take first in front of Gouyave in Gybe Talk, with Team Sauteurs in Homer gaining an admirable third place. The crowds were treated to more high-octane racing in the Senior National Team Sailing Final sponsored by Carib, with Team Gouyave and Gybe Talk crossing the finish line first in front of Woburn in Tomorrow’s Worry, with Petite Martinique sailing Mr X in third place. The afternoon ended when the winning skippers and crews from the Community Class Race Series battled it out in the Champion of Champions Final. A combined crew from the Gouyave Canoe and Sloop Classes took Gybe Talk straight into the lead and proved unstoppable. The crew was already celebrating their victory before even reaching the finish line. The Title, trophy and US$1,000 prize going to Kwesi Paul and his crew. As ever, there was a great atmosphere on the beach as well, with Festival favourite DJ Blackstorm making it a party all the time. The crowds were treated to a wide selection of local foods, traditional dishes and drinks from Community Kitchen food stalls, arts and crafts were on sale and OK Fun Spot from St David’s ran a fun Kiddies Korner in Camerhogne Park with games and a Bouncy Castle. GIZ Consultants ran a very informative booth on climate change which proved very popular with visitors and their families on the beach and Century21 were also present providing an opportunity to get a wide range of information on Real Estate. On Saturday the crowds were also treated to live entertainment with a colourful performance from the dancers and drummers from Conception Dance Theatre, followed by live music from local bands The Edge from Calliste, and Love Vibes from St.David’s. The whole event was rounded off with a special surprise when the sky over Grand Anse Beach was lit up by a wonderful firework display courtesy of Spice Island Fireworks, Dodgy Dock and True Blue Bay Resort — a true high spot to start the week of Independence celebrations. 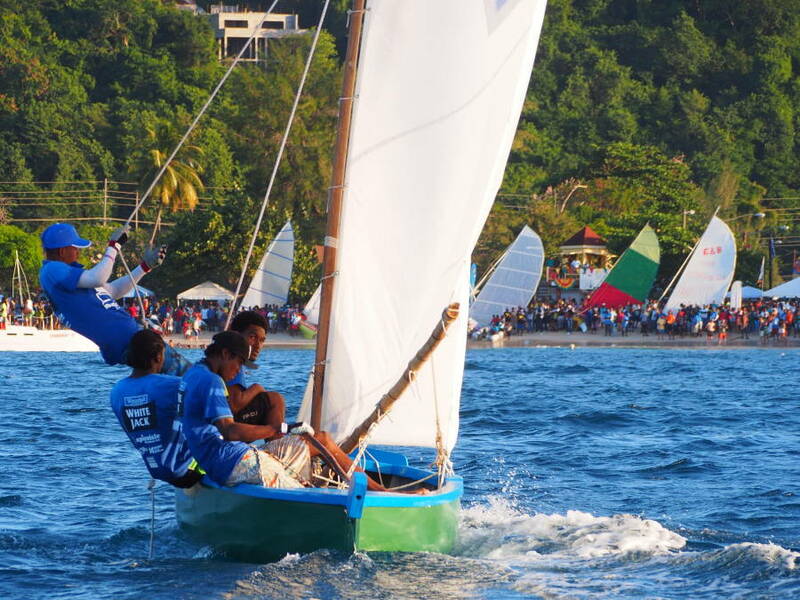 The Grenada Sailing Festival Westerhall White Jack Workboat Regatta, 2015, staged on Saturday & Sunday 31 January and 1 February on Grand Anse Beach and Camerhogne Park. The organisers are pleased to welcome Westerhall Rums as a new Title Sponsor for 2015, and wish to thank all additional sponsors and supporters: Spice Isle Fish House; the Grenada Tourism Authority; Budget Marine; True Blue Bay Resort’s Dodgy Dock; Carib; Massy United Insurance; Waggy T; DeSign Factory; Courts; Aqua Blue; AmeriJet; National Lotteries Authority; L.L. Ramdhanny & Harris Paints; Horizon Yacht Charters; Grenlec; SOL EC; Victory Bar; Andy’s Soup House; Bulk Buy; Sailing School Grenada; Camper & Nicholsons Marinas; Amalgamated Security Services; Century21; Island Dreams Yacht Services; KFC; Sunsation Tours; and Spice Island Fireworks.